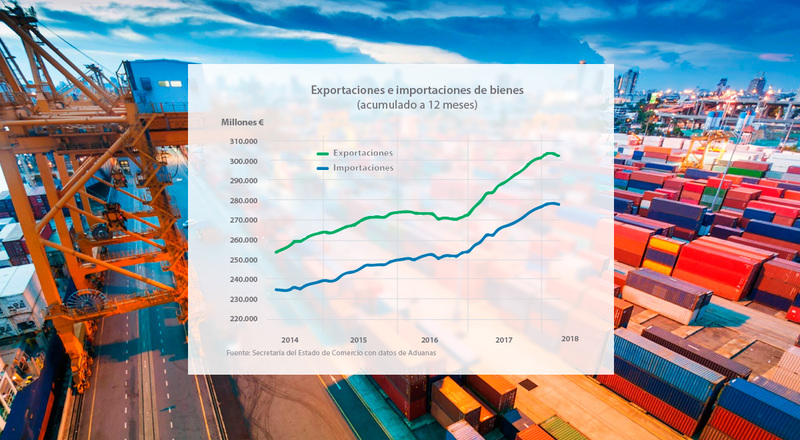 According to ICEX data, exports of goods in Spain during the period January-April reached 94,883 million euros, which represents an increase of 3.7% over the previous year. This growth has reached historic highs in exports in our country. Most of these exports are to the European Union. January: 26,768 million euros in exports. Growth of 8.9% compared to 2017 is noteworthy. The food and stimulant sector continued to grow by 0.4 points. March: 25,606 million euros in exports. This represents a reduction of 2.4% over the previous year. Food, beverages and tobacco declined 1.1 points. April: 23,858 million euros, a 9.5% increase on the same period last year. In food, beverages and tobacco, they add up to 0.9 points. On the other hand, imports also reached record highs and grew by 4.9% compared to the same period last year, reaching 104,866 million euros. This growth increases the deficit between imports and exports in Spain by 18.9% compared to 2017. However, the growth of exports in Spain is below that of the European Union as a whole (+4.3%), the United States (+8.8%) or Japan (5.6%). Although most sectors are increasing their exports, food and beverages, among other sectors, are declining by an average of 1.1%. Among the fastest growing are automobiles and non-chemical semi-manufactured products. The Autonomous Communities that grew most in exports were Navarre, the Balearic Islands and the Basque Country, while others such as the Canary Islands, Asturias and Madrid fell.